Welcome to the official Cheddar It! blog that correlates with every release of each of our videos! You’ll find different ideas on how to use Cheddar It! to enhance your mealtime experience as shown in each video, with some more in-depth descriptions on the processes used. It is our goal to provide you with images and details that will hopefully inspire you to try our products for yourself! We hope that you will check back regularly to find our tips and tricks that can be used at home, in a restaurant and even on a production line. Thank you for reading, and we are looking forward to updating you with more soon! Spicing It Up With Tostadas/Taco Salad Hors D’Oeuvres! So, how did I go about making the delicious, all-cheddar tostada shell and taco salad bowl? Well the first step was to use a 1/2 cup measuring cup (or, as I call it, a Scooper!) along with roughly 1 cup of Cheddar It! and a small bowl that can be used to shape the heated cheese. Using a large pan with low heat, I gently scooped the Cheddar It! onto the center of the pan and patted it down until it was a flat, roughly 6 inch circle of cheddar goodness. I waited until it was nice and bubbling and crisping up, flipped it over and let it crisp on the other side! For the tostada shell, I left the Cheddar It! on the pan for about 30 seconds longer than the taco salad bowl. 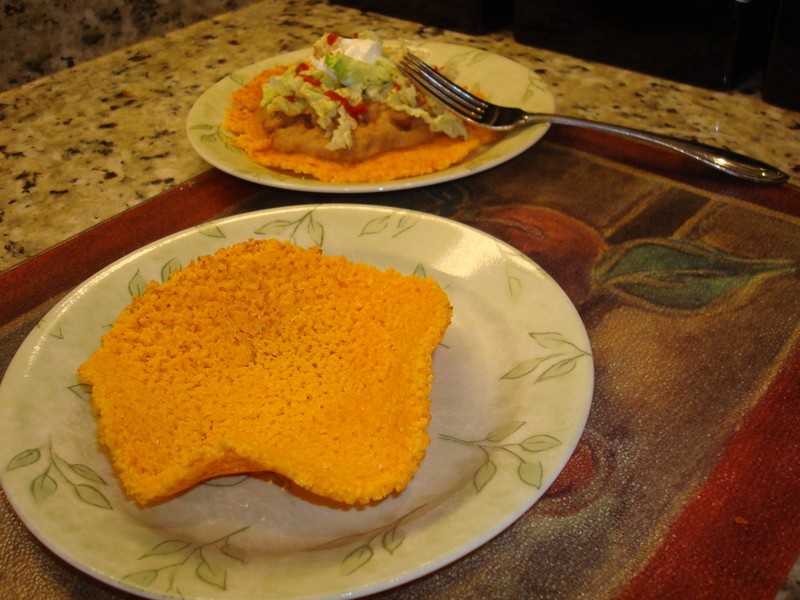 This is because the tostada shell does not require any shaping, so any desired crisp texture is fine. For the taco salad bowl, it is important to have the heat low and not let the cheddar get too hot, or else it can’t be formed and will break when you try to mold it. Be sure to get the cheddar patty onto a paper towel once it’s a slight golden brown, and then gently lay it on top of a small glass/plastic bowl of your choice. Press down gently to begin forming the bowl shape, and wait 2 minutes for the cheddar to cool. 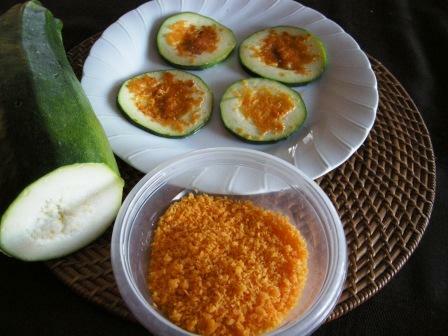 The finished product is a deliciously crunchy bowl of real cheese! Now is where you can get creative; after all, these are not just a delicious post-workout snack, but can also be served as hors d’oeuvres at a Mexican themed party! Add a little guacamole, refried/pinto beans, lettuce, sour cream and hot sauce, and you’ve got yourself some great tasting snacks that will add some unique flavors and textures to your fiesta! If you’re a restaurant owner, placing one of these in the center of your Mexican food platter will introduce new colors, flavors and textures to your valued guests! Be sure to give us a Like on Facebook: https://www.facebook.com/cheddarit and share the word about Cheddar It! with your friends and family! We at Cheddar It! will be happy to get this product out on the market once we get a little bit of a following! Take care, cheddar lovers, and I will speak to you soon. Time to get back to the fiesta! Hello to all you cheddar lovers out there! This week we are introducing the concept of Cheddar It! to the public with the hope that we can gather as many followers as possible before launching the product line. The more likes, shares and follows that the product gets, the better chance we have of bringing Cheddar It! to your local restaurants, small businesses and even grocery stores! In this video, experienced dairy-man Jack Cheddar discusses some of the benefits that Cheddar It! can bring to each and every restaurant and food-related small business. We hope you enjoy the classic Wisconsin accent of Mr. Cheddar…after all, he is a seasoned veteran of “dat derr dairy industry!” Jack Cheddar will be hosting multiple instructional videos featuring ways of using Cheddar It! to enhance your mealtime experience, so don’t miss out! We hope you enjoy, and remember to spread the word about Cheddar It!